Does it matter when someone blinks a lot during a television interview? Absolutely. When you’re a filmmaker, you know these things. Watch this clip from Michael Caine’s brilliant film on “acting for the camera” to get the definitive word on it. One of the top science leaders who has been interviewed lately about the oil spill blinks a lot. I don’t want to mention any names. People get upset about this whole idea of critiquing well-intentioned folks who are trying their best. But as I’ve tried to say, over and over again, good intentions count for absolutely nothing, nothing, nothing when it comes to the superficial media of film and television. Nice guys finish last. Cub scouts get obliterated by the mafia. This entire nation was transformed in my lifetime by Ronald Reagan, a master communicator with all the presentational skills of … an actor. Sadly, image matters. A great deal. Erin Biba wrote an great essay a couple weeks ago in Wired Magazine about the need for better public relations from the science world. I couldn’t agree more with everything she said. Make-up is a key part of image when it comes to television. The idea might be somewhere between repugnant and ridiculous to scientists, but it’s not a laughing matter on a television or movie set. Same with wardrobe. I shot a short film for a group of businessmen a couple of weeks ago. The lead actor showed up with a terrible looking business suit. Had the clients been scientists, they probably wouldn’t have even noticed. But not these guys. The entire production was held up as our production designer did a makeover on his wardrobe. It was refreshing working with people from the business world who don’t question the need for attention to detail when it comes to image presentation. One of my favorite things to point out about my movie “Sizzle: A Global Warming Comedy” was the use of make-up among men in the film. I thought about putting a line into the end credits saying, “Only two men in this movie wore make-up, and they weren’t actors.” I like to ask this of the crowd during post-screening discussions — can you guess which two? It’s not any of the male actors. It was Marc Morano and Pat Michaels — the two most skilled and aggressive of the climate skeptics. Both of them took an extra twenty minutes to get ready as they were in the restroom putting on their make-up. There are two logical responses to this tidbit. The first is to guffaw and say, “Oh, how vain.” But the second, more savvy response is to say, “Wow, those guys really are serious about effective communication.” For the most part, EVERYTHING you can do to improve your image on television will help your audience hear your message more effectively. And yes, I know, it feels like giving in to an element of phoniness. But if that’s your attitude, then you should maybe just stay away from all television cameras. How many times can I say this — it’s a superficial medium. You have to make peace, somehow, with these superficial dynamics. Think that through and you can see how blinking is not something frivolous and superficial. How many times do we have to repeat McLuhan’s mantra — the medium IS the message. Blinking is what you see in timid, shy, nervous people who are not certain of what they are saying. Is that what we want from our science and environmental leaders? It’s a problem. And a final note. 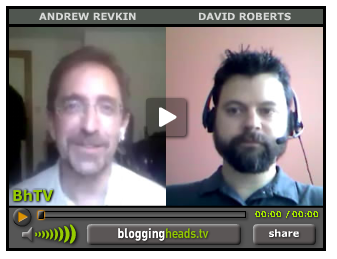 Whoever is in charge of the video recording of “Bloggingheads” — you’re not doing your guests any favors visually. Why don’t you come up with some basic suggestions for them, recommending some source of soft front light for example. Most guests look terrible. I’m sure the producers will answer, “It’s not about what they look like, it’s about what they’re saying.” Well, then why not make it a podcast? “Oh, because people like to see the guests.” Well, then why not help them look their best? All you’re doing is re-affirming the general attitude in the science world that image doesn’t matter. Sorry. It does. BLOGGINGHEADS.TV: Come on, folks, you can make your guests look better than this.